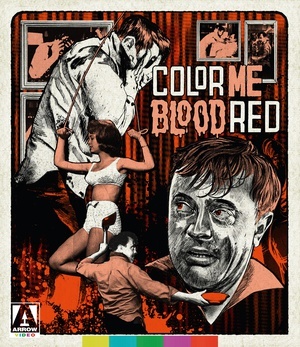 "For the third and final instalment in his infamous 'Blood Trilogy', Color Me Blood Red, splatter movie pioneer Herschell Gordon Lewis turned to the world of fine art for this tortured tale of a troubled artist turned homicidal maniac. Painter Adam Sorge has found himself in a bit of a creative lull. But when his girlfriend accidentally cuts her finger, he realizes what his work has been missing all this time -- human blood! With pressure mounting from local gallery owner Farnsworth to deliver his next masterpiece, Adam sets about procuring as much glorious hemoglobin as he can muster -- first from himself, and then from anyone unfortunate enough to pass by his sickening studio of slaughter. The final filmic collaboration between H.G. Lewis and producer/master exploiter David F. Friedman, who collectively delivered the equally demented Blood Feast and Two Thousand Maniacs!, Color Me Blood Red is a crazed creation that truly puts the pain in painting."